It has come to my attention that perhaps everybody doesn't know how to make a good solder splice. Right now, I'm not going to go into all the details about soldering - properly heating the wire to get the solder to flow or the selection of wire, etc. For that, you'll need to check some of the resources I've linked just below, or go pester your local electronics hobbiest. What I'm going to cover here is just the process of splicing two stranded wires together. If you're dealing with solid wire, you'll need to splice it with a crimp or IDC - Insulation Displacement Connector. Don't even bother trying to solder solid core wires together (though you can tie them together and solder, you're not going to find me suggesting that as the best solution). Fortunatley, solid core wire is not commonly used in automotive applications, which is the focus of this site. 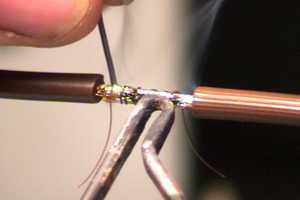 If you want some generic soldering tutorials, check out this Soldering Guide, or this greatly abbreviated one with photos. The sci.electronics.repair FAQ has a section devoted to soldering (and DESOLDERING) techniques. There's also a useful tutorial on How to Desolder. I'm not going to get into the process of desoldering here - the above references should detail it well enough for you, and it isn't really all that applicable to the automotive repair process. Exceptions might be repair of the EFI, Cruise, or A/C ECUs, or of the instrument cluster - though in many cases, you're more likely to be reflowing the solder there (to address fractures or cold joints), not desoldering components. 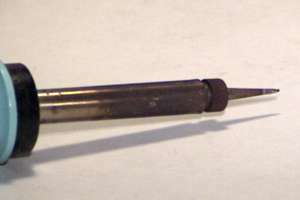 A soldering iron. I have several (including a couple of portable gas powered models, which are useful for using where you don't have mains power, though an inexpensive inverter works wonders for providing AC power on the road), but the two I use at the bench the most are a Weller 40W stick, and a cheap 75W gun-type Radio-Shack special. The gun type is useful for quick repairs, since it doesn't need to be preheated for long, it heats up in a hurry when the trigger is pulled and shuts off when you release the trigger (Warning Will Robinson -- the tip doesn't instantly cool off). However, it outputs considerably more heat and isn't suitable for electronics repair work (both because of the power level, and because of the fat, imprecise tip - it's like equipping a brain surgeon with a cleaver). The Weller stick (or "pencil") iron has a variety of tips available, and I usually have a fairly fine point on it, which makes it good for precision work. For the purposes of this demonstration, I'll be using the gun-type, though a stick iron would work just as well. Weller soldering stick with closeup of the fine tip (various types are available) - you'll note that the tip on this is replaceable, whereas cheaper soldering irons may not be. This particular tip isn't appropriate for splicing wire -- it is too precise, whereas you'd want a slightly stubbier tip so as to distribute the heat into the wire. 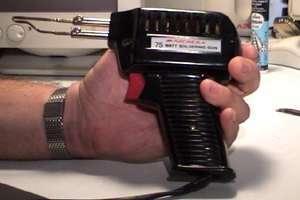 The soldering gun is an inexpensive one, and is ideally suited to wire splicing, while it is ill-suited to precision electronics work. The tip on it is also replaceable, but there isn't a selection of available tips. 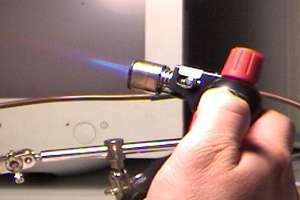 A small gas (in this case, butane - just like is used in a refillable cigarette lighter) torch. This piezo-start Bernz-o-Matic torch also has a clip-on soldering tip, but is inefficient -- I use this for shrinking the heatshrink tubing. 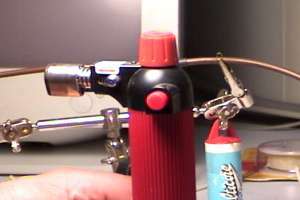 You could use a lighter, match, propane torch, or heatgun (a high power hairdryer of sorts). The key is to wave it back and forth over the shrink tube rather than parking it on it - otherwise, instead of merely contracting, the tubing will melt and burn. I have a small, almost disposable torch which actually uses lighter cartridges for the butane, which has a focused enough flame tip that it can be used for heating wires for solder splices if you're competent enough. NOTE that if you're doing electrical repair work in-situ near the battery, fuel tank, or fuel lines, using the gas torch (which is an open flame) isn't a particularly good idea. Heat is your enemy when it comes to electronics repair - if you overheat a wire, the insulator will start to melt and burn, electronic components can go bad if exposed to high heat (say when you're soldering a wire on a leg of an IC or transistor), and PC board traces can heat up and separate from the PCB substrate if overheated. That's why professionals use stick irons with controllable tip temperatures (literally, they've got a digital readout of the tip temperature, and some method of adjusting that). Since this document is discussing splicing a wire, rather than soldering electronic components, I'm not going to fret too much about this heat issue, but you should keep it in mind. Sponge. 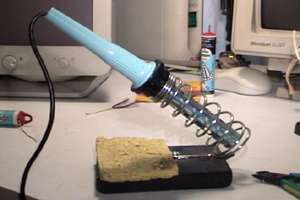 A small piece of wetted sponge is necessary for cleaning the tip of your soldering iron. Without this, oxidized crud builds up on the tip and has a way of making it's way into the joint you're soldering, which isn't good for performance or reliability. There is nothing special about these sponges (well, sure you can probably get special synthetic sponges infused with tip-treating chemicals, but that's overkill unless you're a pro taking care of a prohibitively expensive soldering iron) - steal the old one from your kitchen (just make sure it doesn't have chunks of last nights Lasagne on it). Wet it to the point that it is retaining water, but not dribbling all over. See the picture of the stick iron above. Solder. There are many types - tin/lead and tin/silver/lead being rather common ones. There are types with and without a flux - an etching (basically, a metal-reactive acid) and anti-oxidizing agent which helps prep metal for being soldered. If you've ever done household plumbing work (or repaired a radiator), you've probably dealt with a brush-on corrosive flux, which you apply before fitting the plumbing joints together, and then heat up (probably with a torch, rather than an electric iron) and solder with a beefy-looking coil of plumbing solder. 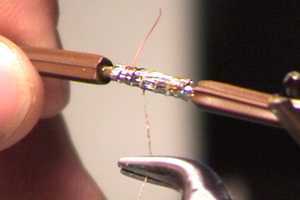 First, that heavy gauge of solder is unweidly when dealing with electronics, and the brush-on flux is as well. 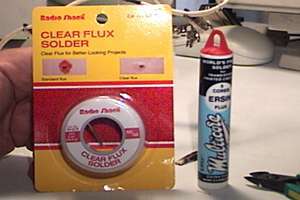 For electronics, one usually uses a solder with a flux core (Ersin and Rosin flux cores are common). 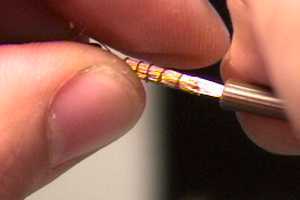 Sometimes brush-on or dip-in fluxes are used for electronics, but generally only when soldering to a larger piece of metal or when dealing with a production line (dipping component leads while assembling something for instance). 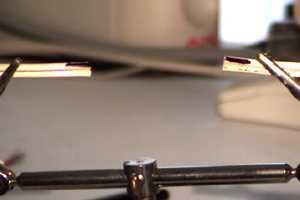 Silver content helps the solder flow, and is itself a good conductor, though silver content is extremely low in solders in which it appears, and isn't a typical electronics solder. Most solders have a high tensile strength - a properly soldered joint is not a weak point, and for that reason, they're much better than simply crimping something. 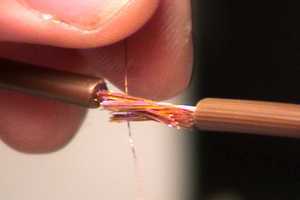 A technique I like to use (though it has nothing to do with the splicing procedure shown below) is to use crimp type connections, and prep a wire with solder (a process called "tinning" the wire - you've probably seen speaker wires with the exposed wires coated in solder to keep them from unraveling, and those have been tinned), then insert that into the crimp connector, crimp it, then reheat it to "reflow" the solder, and apply a touch more solder to it. This gives me maximum contact area between the wire and the crimp fitting, AND ensures that the wire won't slip out of the connector, should the crimp be faulty. I also shouldn't need to worry about corrosion within the crimp connection, because it should be FULL of solder (no air = no oxidization). Typical 60/40 (60% tin/40% lead) electronics solders with non-corrosive flux cores. The lead helps to prevent corrosion. Lower tin content solders are used for things like radiators, and have a higher melting temperature range, while higher tin content is used for pre-coating for soldering, and has a lower temperature range. If you're interested in the specifics of this, you might want to check out this technical article about it. I personally like Multicore solder (that's the brand name of the tube on the right in the picture above) - they have a 5-core Ersin (non-corrosive flux) solder which allows the flux to distribute more evenly and easily, rather than as a bubbly spattery mix as you melt the solder, and they also have wound dispenser tubes (which I refill by wrapping solder from a bulk roll around a pen and drop the coil back into the empty tube). 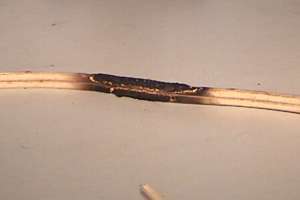 When you solder, you heat the component being soldered, and apply the solder to the heated component. You don't melt the solder on the iron and transfer that to the wire (though you do tin the tip of the iron, and it helps to start the solder flow by directly heating it with the iron sometimes). For the purposes of my discussion here, I'm going to assume you're going to use a flux-core solder appropriate to electronics work, so we don't need to talk about separatley fluxing the wire. An assortment of heatshrink tubing. The shrink tubing shrinks to approx 1/2 of it's original OD when heated, but doesn't change length substantially. I have a much larger selection with my wires (both sizes and colours), but I have a number of small bits of various sizes stuffed into this clear plastic bag for when I need to grab something quick and easy, and don't need a specific colour. Note that the colour isn't terribly important, though they can be matched to general wire colour, and sometimes it is useful to take a piece of coloured shrink tube and shrink a piece at either end of a wire you are running to make it easily identifyable. You can purchase a small package (well, not as large as this here) for a couple of dollars at electronics shops or Radio Shack. I'm personally not too fond of the type with a glossy surface - they seem to be inferior to the matte finish ones. 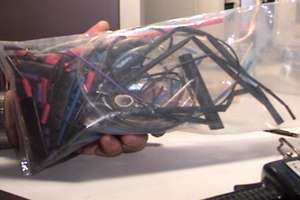 Some suppliers also have a special type of heatshrink which has a sealant inside of the plastic sheath which flows when it is heated, and seals the wire from the environment (think of it as something like stuffing a glop of silicone sealant in the connection before you heat it up), which makes it exceptionally good for marine use, and has is priced accordingly. Unlike electrical tape, heatshrink doesn't degrade into a sticky mess over the years, and it doesn't start to come unravelled, etc. If you can't deal with heatshrink, then the next best thing is a proper application of "liquid electrical tape" - a brush-on insulator (which is handy to have around for insulating a variety of connections which you can't use heatshrink for), and after that, electrical tape. Electrical tape should be your last refuge. 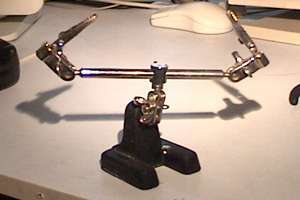 A handsfree clamp. When you go to solder, both of your hands are going to be busy - one will have the soldering iron in it, and the other, the solder. Now, how is it that you're going to hold the two wires that you're joining? Well, if you've got an assistant, or the wires are held in place somehow, you're set. 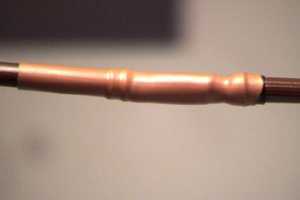 Otherwise, you'll benefit from having a small clamp assembly, readily available from most electronics or hobbiest shops - it consists of a weighted base and a rod with a couple of ball-ends on which a pair of aligator clips are mounted. 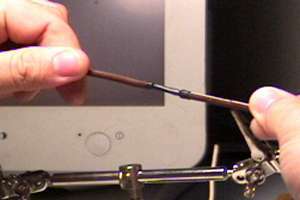 Using one of these, you can clamp your wires together and hold them while you solder. See the photos below. 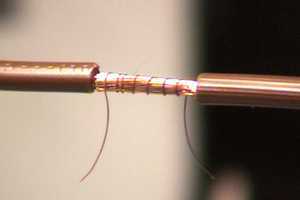 A strand of very thin wire to wrap the wires being joined. I happened across a box with some old plug wires in it at a garage sale, and know better than to use them for anything such as replacing appliance cords (certainly not with this junk) -- but they're excellent for this purpose BECAUSE they're oxidized, which makes the non-corrosive flux and solder not want to stick to them as effectively as they do to clean copper. You can use a regular strand without trouble, but that burned cord is actually better for this particular purpose, so don't throw it out. Note that a little will go a LONG way - you could purchase a one foot chunk of zip cord at your local hardware store and toss that in your soldering kit and probably not need to replentish your supply for several years. I've stripped about 1.5 inches of the insulator away and then cut off the chunk from the cord at approx 3 inches (strip before cutting it short - it's easier that way), which gives me a handy way to retain all the little wires for when I need one. 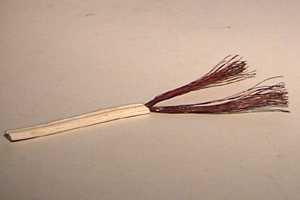 I pluck one from the bundle and set it to the side to have at the ready when I go to splice the wires (see below). If you haven't soldered much, you probably want to get some spare wire and practice a bit before taking the torch to something which will get progressively more difficult to repair if you botch it up while learning. Okay, I figured I'd take a wire and make a splice for you, but for some stupid reason, I figured I'd just use a piece of the aforementioned burned wire to do this (because I don't need anything spliced at the moment, and I have several of those funky cords to dispose of). However, owing to the fact that the oxidized wire won't flow the solder very well, the first few photos show white zipcord, and then I finish the job with a piece of new zipcord. For effect, I took a torch to the wire to simulate the damage which you're trying to repair. 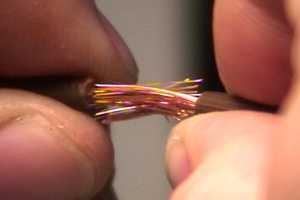 If you have more than one conductor that you have to splice, make sure you know who is going where BEFORE you cut. Here, I've marked one of the two conductors with a black permanent marker. In fact, for _this_ type of wire ("zip cord" - the wire used on household extension cords and lamps), one insulator either has a series of ribs on it, a solid line, or something to differentiate it from the other. In your engine compartment though, you may have a couple of wires on which the original markings are nearly impossible to discern, and with the years of engine crud built up on them, they are too difficult to identify as separate wires. For sensors, and switches, this might not be a big deal, for relays and some other sensors and switches, it could be significant. So, before you cut any wires, mark them, even if only with a bit of tape on each matching wire. We formally cut out the damaged part of the wire (if necessary -- you might just be dealing with a broken wire, or adding an extension, etc.). If you're working with a multiple conductor wire (such as this zip cord), separate the wires and spread them. On at least one side of the splice, you want at least an inch and a half of free run on which you can slide the piece of heatshrink tubing. The further away from the solder point which you can slide the heatshrink while you're soldering, the better -- if the free run length on the wires you're splicing differs, run the shrink tube up on the longer wire, as this will locate it further from the heat you introduce while soldering (which could cause it to shrink). You want a length of shrink tubing that will overlap your splice by approx 0.25" on either side. If you want, you can "stack" multiple pieces of shrink tube over the same spot as necessary. Doofus me, I'm here making an tutorial, and I cut this wire straight up. There s nothing strictly wrong with doing this, but if you can avoid it, don't cut all conductors at the same point -- if you offset them (say, by approx 0.5" - 0.75" or so), when you've added the shrink tubing to each splice, you won't end up with a wire that looks like a snake that just swallowed a field mouse, because you'll have offset the splices. Also, note that the wire I'm splicing here (and more noticeable down below when I switch to a new piece of wire) is household wire -- rated for over 100VAC, and thus has a much thicker insulation than you'll encounter in most automotive wiring (which runs at 12VDC). When working with a multiconductor wire (2 or more wires run together), you should consider running a larger piece of shrink tubing up over the complete bundle, in addition to the ones over the individual conductors. After you've completed splicing the individual wires in the bundle, you can slip this back over the bundle and shrink it, adding additional environmental and electrical insulation to the wire, but also retaining the wire bundle together. As previously noted, Heatshrink doesn't degrade into a gooey sticky mess as does virtually all electrical tape. Make sure to use a length of shrink tube long enough to cover the whole patch. Keep in mind the note in the previous section about offsetting the splices if you can do so. Strip approx 0.5" of the insulator from the ends of the wires you are splicing together (if you've marked the wires to pair multiple conductors, make sure the mark runs further than the insulator you're going to strip off), and ensure that the wire is trimmed to equal lengths (you really don't want jaggy strands of wire). Additionally, make sure that the wire is clean and free of corrosion and oxidization, or it won't take to being soldered very well. Now, put the wires in your handsfree clamp arranged such that the conductors fully reach each other (you might adjust the ball joint tension so that the wires will move if you give a light tug on them). Carefully cram the wires together - you want the individual conductors to blend together, like you're shuffling a deck of cards (in three dimensions no less). Don't twist the wires, and don't pre-tin them - doing so will defeat the purpose. 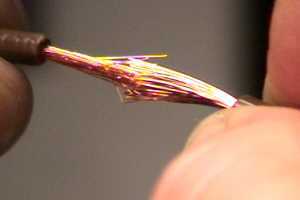 With the two wires "blended" together, bring in your strand of wrapping wire, and wrap it around the joint. 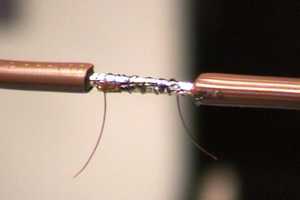 After you've done the basic wrap, give the wires a little shove towards each other, so that the very tips of each side nearly reach the insulator of the opposite wire. Then give the wrapping wire a final snug, perhaps unwinding the very ends and making sure that they're wrapped on the OUTSIDE of the bundle (if you practice this a few times on scrap wire, you'll gain an understanding of why you want the wrap wire on the outside). 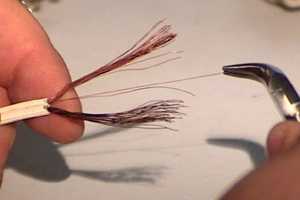 This process will ensure you have the best possible connection and will reduce stray wires. You do not want the ends of the spliced wire coming out "frayed" - they should all be parallel to the joint. Frayed wires have a way of poking through the insulator when you don't want them to. Before you start soldering, mentally run through the steps - you have the right wires put together? Is the heatshrink on there (and if you're colour coding, is it the proper colour)? Are there special connectors, housings, or grommets, etc, which need to be run on the wire BEFORE it is soldered? Are the connectors facing the correct direction? Everything looks right? Okay, now make sure that there is something protecting the area underneath the area where the wire is while you're soldering -- if the solder should splatter or drip, you don't want it landing on something which will take offence at this. That means putting out a newspaper (or file folder, etc) on the heirloom dining room table before using it as a soldering workbench. 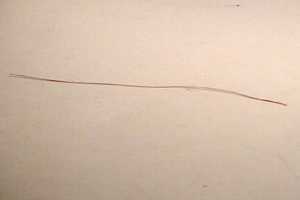 Likewise, if you're soldering a wire in-place in the car, you want to make sure to lay out a rag or something below the wire you're soldering, so as to catch any droplets. As you develop a feel for the soldering process you won't end up splattering droplets often, but you should still lay out a protective covering. 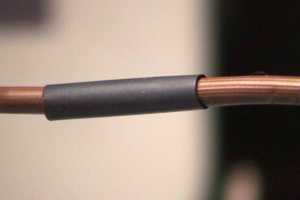 Now, solder the splice -- if using a stick iron, it should be preheated, and if a gun type, before contacting the wire, pull the trigger and let it heat up -- you'll know it is the right temperature when you can touch the tip of the iron with the solder and tin the tip. Do that, and clean the tip of the iron on your wetted sponge. Then, place the tip of the iron on the wire. I find placing the iron under the wire (heat rises, gravity - such as the solder flow - falls) and contacting the solder to the top of the heated wire works best in most situations. Remember, you're heating the WIRE, not the solder itself (though after heating the wire up, touching the solder to the tip of the iron to get it to start flowing is useful - if it just beads up, things aren't warm enough yet). Once it is flowing, move the strand of solder back and forth across the wire, and don't stop just because the surface of the wires has solder on it -- you want the solder to run to the core of the joint, and you also want to have the solder all the way around the joint (which may require rotating the wire and reflowing the solder on the opposite side, though once you've got the hang of it, this isn't generally necessary). Try to keep from burning the insulation - if it starts to smoke and shrivel, you're overheating it (something all too easy to do it you use an overpowered gun-type iron). The wire has been soldered. Now, unwrap the retaining wire -- because it is very small, and on the surface, it should come off without too much difficulty. See the note above about the wire I used to wrap this with. 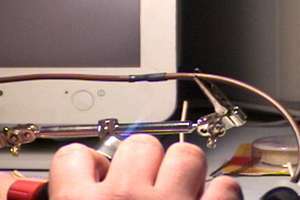 If you're extra retentive, you might want to give the wire a light hit with the soldering iron to "re-flow" the solder on the surface (to eliminate the little ridges the wrap left behind), but it isn't strictly necessary, and if you don't know what you're doing and overheat it, you may weaken the joint. If you wanted to be extra retentive about the joint, now that it has been soldered, you might spray or brush on an anti-oxidizer, such as the sealant you use on battery terminals. 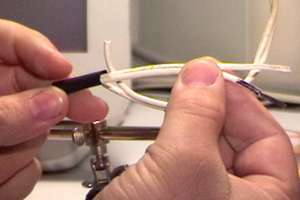 Shrink tubing is slid down the wire and over the splice. Remember - the shrink tube should have been placed on the wire BEFORE you soldered, and should be slightly longer than the gap of the splice. Using the gas torch to shrink the heatshrink - note in the first picture, how the left side of the heatshrink is smaller than the right - that's the tubing shrinking in the presence of heat. Remember not to linger, and don't forget that you need to go all AROUND the tube - get the back side too! Just as with the soldering itself, this is something you might want to practice a little before doing it on something that matters - if you melt the heatshrink, you have to unsolder the wire (and in fact, CUT it, because the flowed joint won't mesh back together) to put a new piece of heatshrink on there. When heating it, keep the flame back at least an inch or two from the surface -- you'll get plenty of heat off the front of the torch (or above a lighter). As noted above about the use of gas torches, you should excercise caution when working around components which may have flammable fumes.